The majestic Horse has been represented in Art since the days of prehistoric cave paintings. I am no expert in breeds and could not tell whether the animal in the above image was, in fact a horse, maybe a Bay, or even a mule, combination of horse and Donkey (anyone with a better idea, don’t hesitate to chime in). All I know is a picturesque scene when I see one, and this clearly fit the bill. Driving up the road toward a ranch near Winter Park just after a light snow, the beautiful brown coat and white back and eyes caught my attention. 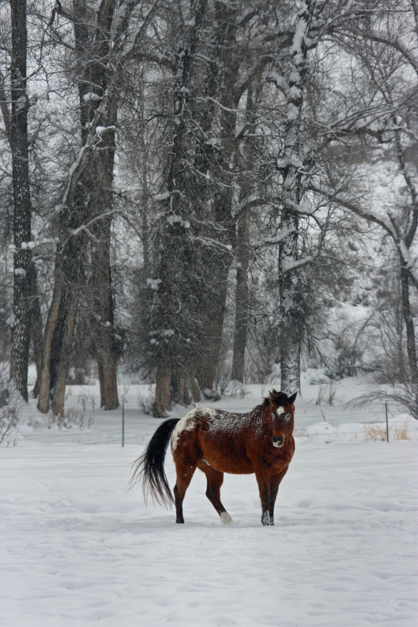 The beauty and character of many equine subjects work extremely well in a Fine Art photograph. For me, the right composition (location of the animal in the scene) is key as are the details of the animal’s pose. The placement of the head, legs and even the tail can make or break an image. Patience is a virtue with horses. They usually stay in one area for a while unless they become curious and approach you looking for food. In this case, the momentary lift of a seemingly painted head, with a body lightly covered with snow, created the perfect subject against the snow-covered trees. Sometimes less is more. This is an example of using negative space to create an ethereal image of an isolated subject. 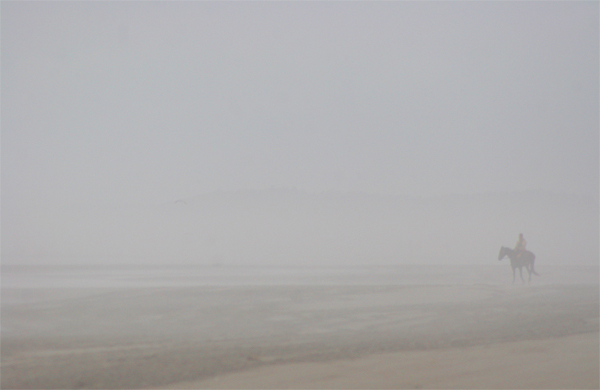 The lone horseman on this Pacific Northwest beach looked out to Sea in the morning fog. The mountain range behind him can barely be seen, but became more evident as the fog lifted. Here, the horse and rider stand alone to signify peace and solitude. Again, timing is everything in that immediately after the image was created, the rider was gone and the fog soon lifted. WordPress works great and is free. No, I am always credited as far as I know.